To Cite: Sam Daliri S, Samadi Kafil H, Aghazadeh M, Fateh A, Yousefi M, et al. Extraction and Biological Evaluation of the Membrane Vesicles of Mycobacterium tuberculosis (CRBIP7.11) as Adjuvant and Vaccine Candidate, Jundishapur J Microbiol. 2017 ; 10(3):e39953. doi: 10.5812/jjm.39953. Background: Membrane vesicles are non-viable structures released by pathogenic bacteria. They contain numerous antigenic materials from the bacterial outer membrane, making them attractive targets for use as vaccine antigens. The membrane vesicles are related to the virulence because of their capacity to concentrate immunomodulatory molecules and toxins. Objective: In the present study, we examined the membrane vesicles of Mycobacterium tuberculosis as adjuvant and vaccine candidate. Methods: Mycobacterium tuberculosis standard strain CRBIP7.11 was cultured at 37°C in Loewenstein Johnson (LJ) media for 3-4 weeks. To confirm the species, standard microbiological and biochemical tests were performed. After preparation of membrane vesicles, the amount of protein in membrane vesicles was measured by SDS-PAGE and Nanodrop. To analyze the integrity and morphology of extracellular vesicles, transmission electron microscopy was used. The lipopolysaccharide was determined using the Limulus Amebocyte Lysate (LAL) kit. Results: The total mass of vesicular fraction was 4.8 mg. SDS-PAGE showed protein bands in the approximate regions of 35, 40, 70, and 90 kDa. The amount of membrane vesicles total protein was 1.26 and 1.29 mg/mL. Transmission electron microscopy analysis of pellets revealed that the extracted vesicles are 50-200 nm in size. Also, LaL test showed negative results (values were less than 300 IU). Conclusions: The results of the present study give important evidence that actively released mycobacterial vesicles are delivery instruments for immunologically active molecules involved in mycobacterial virulence. Mycobacterium tuberculosis is an intracellular bacterium causing tuberculosis (TB) that continues to be a major health threat (1). It seems that TB will remain as one of the ten epidemic diseases by 2020 (2). Therefore, control and prevention of the disease are of great importance (3). Vaccination is the best way to avoid the consequences of infectious diseases such as TB in humans and animals. The common vaccines mainly consist of live attenuated pathogens or subunit vaccines. However, Bacillus Calmette Guerin (BCG) as the currently available vaccine for TB has several flaws, such as variable efficacy in various populations, and limited success against pulmonary TB that account for short-term immunity and most of the disease burden (4). The current trend is the development of subunit vaccines using modern molecular and biochemical techniques for the isolation of different macromolecules of organisms causing disease. However, a main difficulty experienced during the development of modern vaccines is their weak immunogenicity (5). To improve the immune response, adjuvants can be used in vaccine antigens to serve in several ways, such as enhancing the immunogenicity of weak antigens, increasing the duration and speed of the immune response, promoting the induction of humoral immunity, stimulating cell mediated immunity, and decreasing the dosage of antigen in the vaccine as well as reducing the cost (6). Naturally, some bacteria such as M. ulcerans, M. bovis, and M. tuberculosis release own membrane vesicles in a variety of growth environments, which suggests that delivery systems and vesicular transport are additionally found among mycobacteria (7). The production of membrane vesicles in multiple species of non-pathogenic and pathogenic Mycobacterium spp. represents that the release of membrane vesicles is a conserved feature among the species (8). These membrane vesicles have been widely studied in the outer membrane of Gram-negative bacteria, which by a process that includes “pinching off” and budding are released into the surrounding environment (9). The vesicles have different sizes from 50 to 250 nm in diameter, and contain periplasmic compounds including proteins, phospholipids and lipopolysaccharide; they can also carry the extra virulence factors like toxins and immunomodulatory or adhesion compounds that are necessary for pathogenesis (9). Membrane vesicle interaction with macrophages isolated from mice can stimulate the release of chemokines and cytokines through Toll-like receptor 2 (TLR2)-dependent pathway. Thu the injection of membrane vesicle to the mice lungs causes an inflammatory cascade response. Proteomic analysis showed that only membrane vesicle of pathogenic species has TLR2 agonist's lipoprotein. There is strong evidence that active release of mycobacterial vesicles is a transmission mechanism for immunological molecules involved in mycobacterial virulence (10). The presence and importance of membrane vesicles released by bacteria growing on solid agar, within biofilms, in vivo and in vitro, will become increasingly clear (10). These vesicles have been shown to affect the physiology of neighboring recipient cells in different courses, from inducing intracellular signaling following binding to receptors to conferring new properties after the acquisition of new enzymes, receptors or even genetic materials from the vesicles (11). With the growing incidence of infections caused by M. tuberculosis and the emergence of multidrug resistant strains, we need a new effective vaccine against the disease. The current study aimed to evaluate the membrane vesicles of M. tuberculosis (CRBIP7.11) as adjuvant and vaccine candidate. Mycobacterium tuberculosis standard strain CRBIP7.11 was used to produce the membrane vesicles. Bacteria were cultured at 37°C in Loewenstein Johnson (LJ) media ( Pasteur Institute of Iran, Iran) adjusted to 1 McFarland turbidity for 3 - 4 weeks (12). For confirmation of the species, standard microbiological and biochemical tests, including pigment production, growth rate, niacin production, catalase activity, and nitrate reduction were performed (13). After the bacterial confirmation, the biomass was rinsed with phosphate-buffered saline (Sigma, UK), and divided into 4 tubes followed by centrifugation (1000 × g for 20 minutes). Then, the pelleted bacteria were inactivated by heat (80°C for 2 hours) and re-cultivated on LJ medium. The inactivation was confirmed by 3 - 4 weeks incubation and observation of no bacterial growth. Vesicles were isolated as described previously (14). Briefly, the cell harvest was centrifuged and re-suspended in NaCl buffer. Then, the cell suspension was homogenized for 30 minutes and the total wet weight of the suspension was measured. Next, the cell suspension was concentrated by centrifugation for 1 hour at 2900 × g and the cell pellet was re-suspended in 7.5 times wet weight of 0.1 M Tris-10 mM ethylenediaminetetraacetic acid (EDTA) buffer. The extraction of the vesicles was performed by adding 1/20th volume of 0.1 M Tris, 10 mM EDTA, and Sodium deoxycholate (100 g/L) buffer (Merck, Darmstadt, Germany). Vesicles and cell debris were separated at 20000 × g at 4°C for 60 minutes (model L8 - 80M; Beckman Instruments, Inc, Palo Alto, CA). The vesicle-containing supernatant was concentrated by ultracentrifugation at 125000 × g at 4°C for 2 hours. The membrane vesicle pellet was re-suspended in 10 mM EDTA, 0.1 M Tris, and Sodium deoxycholate (5 g/L) buffer, and the suspension was centrifuged again at 125,000 g at 4°C for 2 hours. The concentrated membrane vesicles were re-suspended in 3% sucrose solution, filtered through a 0.22-µm-pore-size polyvinylidene difluoride filter (Millipore, Billerica, MA), and divided into 20 and 50 mL sterile vials for lyophilization. To estimate the amount of protein in membrane vesicles, SDS-PAGE (sodium dodecyl sulfate polyacrylamide gel electrophoresis) and Nanodrop (Thermo Scientific, Wilmington, DE, USA) instruments were used. 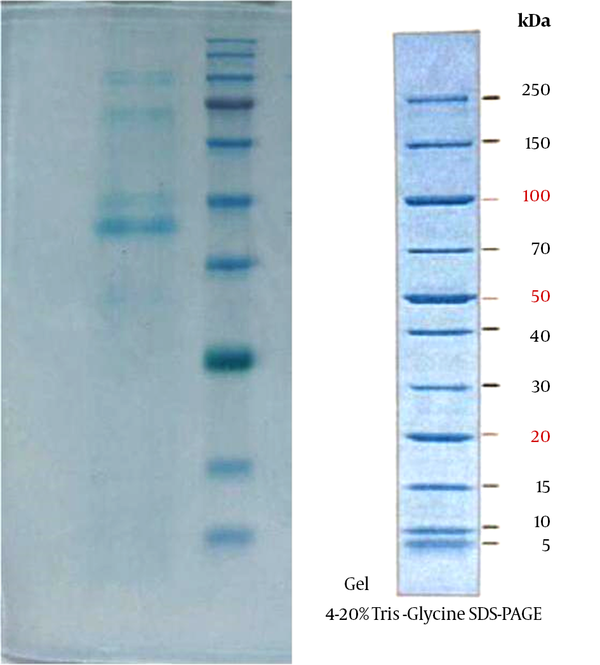 Proteins (5 μg) of membrane vesicles and mycobacterial fractions were separated with 12% SDS-PAGE. After electrophoresis, proteins were stained by 0.1% (w/v) Coomassie blue or silver staining (14). Membrane vesicles were ultrasonically treated to disperse the vesicles followed by attaching to Formvar/carbon-coated nickel grids. Grids were washed with a 0.01 M PBS supplement, 0.1% gelatine (PBG), and 0.5% BSA. The vesicles on the grids were fixed with 1% glutaraldehyde in PBS at 4°C for 60 minutes and negatively stained with 1% potassium phosphotungstate pH 7.5. The grids were examined using a Zeiss EM10C transmission electron microscopy operated at 80 KV (14). The biological activity of the endotoxin was measured using the QCL-1000® chromogenic Limulus amebocyte lysate (LAL) endpoint assay (Lonza, Walkersville, MD, USA). To this end, 0.1 mL of LAL with 0.1 mL of the sample was incubated for 88 minutes at 38°C. Then, by adding 0.5 mL of the substrate, the mixture was incubated again for 3 minutes. Finally, by adding 0.1 mL glacial acetic acid solution, the reaction stopped. Optical density (OD) of the reaction mixture was determined by a spectrophotometer at 405 nm and the amount of Endotoxin in the sample was calculated using the standard curve. Following detection and confirmation of the bacterial strain, we first investigated whether the M. tuberculosis CRBIP7.11 strain is capable to release vesicles. Therefore, the washed bacterial strain was isolated in 4 falcon tubes and then inactivated by heat. The total mass of this vesicular fraction was 4.8 mg. Vesicle-associated protein analysis, performed by SDS-PAGE, showed protein bands in the regions of 35, 40, 70, and 90 kDa (Figure 1). The results of physicochemical analysis of vesicles extracted from wild-type M. tuberculosis conducted by Nanodrop instrument showed that the amount of membrane vesicles total protein was 1.26 and 1.29 mg/mL. To investigate the purity and stability of the natural form of the membrane vesicles at different stages of the purification process, transmission electron microscopy (TEM) was used. Spatial characterization of extracted membrane vesicles in negative staining captured by a Zeiss EM10C transmission electron microscope is shown in Figure 2. TEM analysis of pellets obtained from mycobacterial culture supernatants showed the extracted vesicles were 50 - 200 nm in diameter and in terms of consistency, they did not maintain the spatial properties at different stages of extraction and purification. Also, LaL test showed negative results (vales were less than 300 IU). Mycobacterium tuberculosis infects a vast majority of the human population, but only a small fraction of those infected develop clinically significant disease (15). This epidemiological fact suggests that most human hosts mount effective responses to M. tuberculosis controlling the infection (16). The present work represents the production of membrane vesicles in the most clinically important species of mycobacteria. In this study, a clinical strain of M. tuberculosis was cultured in LJ medium. The extraction and purification of membrane vesicles were conducted using a modified method of Claassen et al. Also, the pattern of membrane vesicles total protein was observed by SDS-PAGE that showed bands around 35, 40, 70 and 90 kDa. Therefore, 50 to 200 nm membrane vesicles were observed using transmission electron microscopy. Electron microscopy showed that the spatial structure of M. tuberculosis vesicles has preserved its natural shape and remained normal at different stages of the purification process; the result that is in agreement with the results obtained in other studies (10, 14). In a study carried out by Prados-Rosalese et al. wide proteomic investigation showed that only membrane vesicles derived from the virulent strains consisted of the agonists of TLR2 lipoprotein (10). The interaction of membrane vesicles with macrophages isolated from mice was shown to stimulate the release of chemokines and cytokines in a TLR2-dependent model, and infusion of membrane vesicles into mouse lungs evoked a florid inflammatory reaction in WT but not TLR2-deficient mice. In their research, before M. tuberculosis pulmonary infection, when membrane vesicles were administered to mice, an accelerated local inflammatory reaction with increased bacterial replication was observed in the spleens and lungs (10). The success of M. tuberculosis as a pathogen is to some degree due to the ways in which M. tuberculosis exploits and evades distinctive cell subsets to persist and cause disease. Mycobacterium tuberculosis expresses many molecules to keep its recognition and destruction by immune cells. BCG, the main authorized TB vaccine, is effective in preventing the spread of infection in newborn children. However, it presents highly variable efficacy against pulmonary TB in adults, especially in developing countries (17). A greater comprehension of the reasons for this variability along with a better understanding of the early, innate, and non-antigen specific mechanisms of protection would help develop more effective vaccines (17). To gain better insights into membrane vesicle biogenesis and function in M. tuberculosis, a few researches have been performed (18). Vesicles released from pathogens have been utilized for a long period in the development of immunogenic vaccine candidates against particular organisms from which the vesicles have been obtained. To create a niche within the infected phagosomes, M. tuberculosis secretes molecules modulating the host immune response (19). Many of these molecules are derived from the cell wall and secreted during the infection. These components include the lipoproteins that are potent agonists of TLR2 (20) and lipoglycan lipoarabinomannan (LAM), which inhibits phagosome maturation (21). Despite the fact that common immunity is promoted by the activation of TLRs, prolonged TLR2 signaling by M. tuberculosis inhibits class II MHC (MHC-II) antigen presentation to CD4+ T cells and may induce other immune-suppressive mechanisms (e.g., via IL-10) (19, 20, 22). VirR manages the generation of these vesicles consisting of the TLR2 ligand and thereby controls the stimulation of the host immune system, leading to M. tuberculosis growing in the host (23). The production of membrane vesicles by M. tuberculosis is also upregulated under iron-limiting conditions, and these vesicles are enriched in the siderophore mycobactin (24). These outcomes further back the idea of vesicles being public goods, as iron-loaded membrane vesicles were able to support the growth of a defective mutant in iron chelation as well as the growth of wild-type M. tuberculosis grown under iron- restricting conditions. Outer membrane vesicles are extremely complex supramolecular structures. They contain immune stimulators (e.g. proteins, lipopolysaccharide and DNA) and antigenic molecules that can be delivered to immune competent cells of the immune system to trigger maturation as well as activation signals (25). Therefore, outer membrane vesicle has a natural adjuvant effect on loaded antigens from bacteria, additionally on heterologous antigens that can be incorporated or combined in a single formulation (25). outer membrane vesicle based vaccines were created more than 20 years ago against Neisseria meningitidis serogroup B (14). These nano-sized structures have shown significant potential for immunomodulation of immune responses and delivery of meningococcal antigens or unrelated antigens incorporated into the vesicle structure. For these reasons, vaccines containing outer membrane vesicles have been created for a number of Gram negative bacteria, including Neisseria meningitidis, Vibrio cholerae, and Helicobacter pylori (26-28). Vaccination with outer membrane vesicles has been appeared to elicit mainly serosubtype specific bactericidal antibodies against multiple bacterial antigens; in any case, some cross-reactivity increasing after three doses of immunization in adults has been shown in some studies (29). Although lipopolysaccharide is a toxic molecule in vesicles, it acts as a potent adjuvant. LAL test results in our study showed that the amount of lipopolysaccharide in the M. tuberculosis membrane vesicles is within the allowable percentage of biological products, and can be injected into laboratory animals. Based on the obtained results, the membrane vesicle of M. tuberculosis is one of the important alternatives to BCG vaccine to prevent TB infection, characterized by low-cost, rapid preparationand cost-effectiveness. On the purification of bacterial cell components, extensive research has been carried out. The researchers believe that the basic structure of the bacterial antigens is very effective for inducing immune responses. Our results give some evidence that actively released mycobacterial vesicles are a delivery mechanism for immunologically active molecules related to mycobacterial virulence. The adjuvant potential and increased knowledge in the design of outer membrane vesicle throughout the most recent decades will also enable researchers to develop the next generation of novel vaccine formulations in future. These discoveries may also open up new horizons for comprehending the pathogenesis of TB and developing vaccines. This project was financially supported by immunology research center, Tabriz University of Medical Sciences, as thesis of Ms. Shirin Sam. The ethics committee of the University approved this project with reference number 1393156. Authors’ Contribution: Shirin Sam Daliri participated in the data collection and drafting the manuscript. Hossein Samadi Kafil participated in design of the study, bacteriological studies and critical revision of the manuscript for important intellectual content. Mohammad Aghazadeh participated in design of the study and study supervision. Abolfazl Fateh participated in antimicrobial study. Mehdi Yousefi participated in design of the study. Seyed Davar Siadat participated in study supervision, design of the study, and critical revision of the manuscript for important intellectual content. All authors read and approved the final manuscript. Funding/Support: This study was supported by the aid of a grant from the immunology research center of Tabriz University of Medical Sciences (TBZMED). The present manuscript was written based on a dataset of MSc thesis of Shirin Sam Daliri registered at Tabriz University of Medical Sciences.